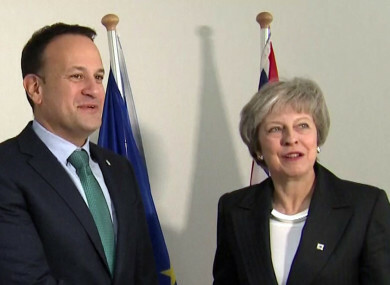 Varadkar and May greet each other in Brussels. TÁNAISTE SIMON COVENEY has said that Taoiseach Leo Varadkar and UK Prime Minister have a “good” and “professional” relationship, after a UK newspaper claimed that May “loathes” Varadkar. In an article in today’s Mail on Sunday, it is claimed that May and Varadkar do not speak directly about Brexit issues because May does not like her Irish counterpart. Responding to this claim this afternoon, Coveney told RTÉ’s The Week in Politics that it was incorrect to say that the pair do not communicate. “I think that’s absolute nonsense, everytime that the Taoiseach and the Prime Minister are at the same council meeting they meet with each other and they talk. They have a good relationship, it’s a professional relationship. I have a strong relationship with David Lidington who is effectively deputy prime minister, we talk by phone regularly,” Coveney said. No, I don’t think so at all. I think somebody’s given a bum steer there to the newspaper that you quote. The Taoiseach’s relationship with the Prime Minister is a good one, it’s a professional one and it needs to be at the moment. My relationship with David Lidington is a very close one and a very warm one, that’s true. But the senior politicians in both governments are working together to try and find a way forward to test ideas with each other. “But let’s be clear, Brexit isn’t a bilateral negotiation between Ireland and the UK, it’s a negotiation between the EU and the UK collectively,” Coveney added. Email “A UK newspaper said that Theresa May 'loathes' Leo Varadkar, but Simon Coveney says it's 'nonsense' ”. Feedback on “A UK newspaper said that Theresa May 'loathes' Leo Varadkar, but Simon Coveney says it's 'nonsense' ”.